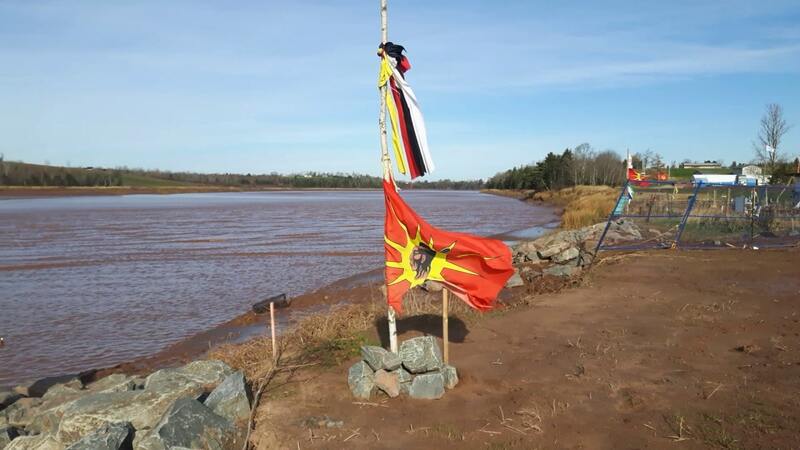 KJIPUKTUK (Halifax) – As widely reported Alton Gas last week filed an injunction with the Nova Scotia Supreme Court, hoping to force Mi’kmaq water protectors and their allies to abandon the site where the company intends to dump brine into the Shubenacadie River. Any structures would also be removed if the injunction is granted. Alton Gas proposes building several underground salt caverns to store liquid gas. Construction would involve dumping thousands of tons of salt brine down the Shubenacadie River every day for over a year. This threatens the fish in the river and the people who depend on that fish for food, ceremony, and livelihood, the water protectors say. “I am simply using my treaty right to protect the river and also to make the government obey its own laws,” says Dale Poulette, a Mi’kmaw water protector who has lived at the site since the fall of 2016. Based on conversations with federal and provincial bureaucrats Poulette and fellow water protector Rachael Greenland-Smith say that the company’s current plan to discharge brine into a channel and subsequently into the Shubenacadie River is not in compliance with federal regulations. This caused them to ask the provincial minster of environment why provincial industrial approvals for the project were not suspended until the company can demonstrate compliance with federal regulations. They also asked why the company did not consult with the federal department to develop a monitoring plan on the salinity discharge. Just today there was further evidence the water protectors were on to something. An announcement by Environment and Climate Change Canada states that the department is initiating the development of proposed regulations to govern the deposit of brine. The regulations will manage the risk of potential threats to fish, fish habitat and human health from fish consumption. The public will be able to submit written comment on the proposed regulations, the announcement concludes. “This justifies why we are here. We’re peaceful and simply trying to ensure that there are no laws being broken. Meanwhile they’re trying to remove us, breaking Treaty laws and provincial and federal laws,” Poulette says. Poulette believes that their insistence on accountability contributed to today’s announcement by the feds. Right now, though, the focus is on dealing with the injunction. The case will be heard March 12. The water protectors are asking sympathizers for financial support to help pay for a legal defence team. Dale, Dorene, Rachel and all Stop Alton Gas Water Protectors are doing the right things. Sustainable Northern Nova Scotia ( SuNNS) stand in solidarity with your Treaty rights based environmental struggle.